ROOM FOR THE BOAT OR CARAVAN!!! Perfectly tailored for family living and positioned for a life of ease and convenience, this appealing four-bedroom beauty offers the quiet enjoyment of court living with the added bonus of Langwarrin Equestrian & Recreation Reserve at your back door. Situated on an 850sqm (approx) allotment, the residence features an elegant master bedroom at the front of the home with bay window, a walk in robe and ensuite, a separate living room, formal dining area including wall mounted split system heating and cooling unit. Comfortably zoned for family convenience, the children's wing offers two lovely bedrooms with built-in robes and a family bathroom with separate toilet. A seamless transition to the open meals/separate family room with 4th bedroom or study from the well-appointed kitchen with loads of cupboard space; s/s dishwasher, built in Delonghi oven and gas cooktop. The grounds are generous in size with entertainers alfresco, lush grass areas & built in swings for the kids to enjoy. 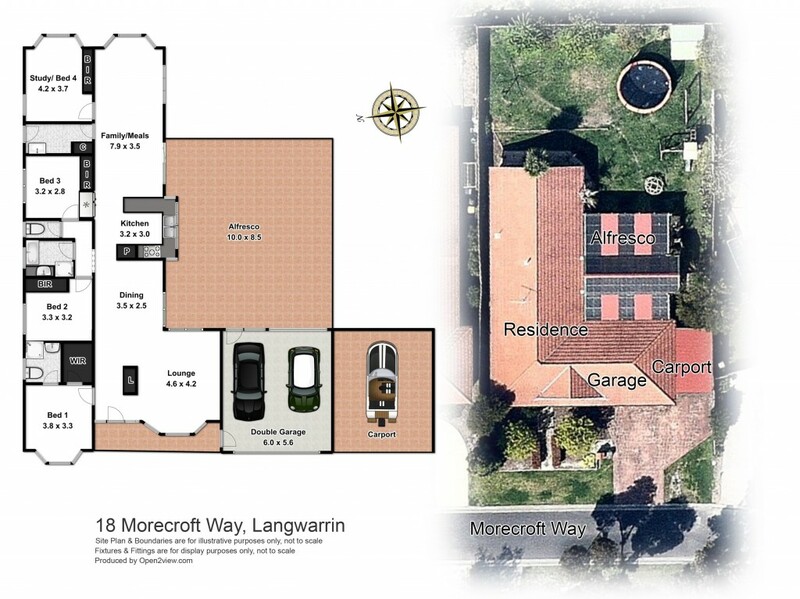 A garden shed and double remote lock up garage with attached carport both with access to the backyard. Court living is rare living and when you find a property; this close to parks, schools, shops and public transport with a genuine court feel; it's a must inspect proposition. PHOTO ID REQUIRED AT ALL OPEN HOUSE INSPECTIONS.